A bookmark, like its real-world namesake, is a means of putting a marker down for easy access. With FME the bookmark covers an area of workspace that is usually carrying out a specific task, so a user can pick it out of a larger set of transformers and move to it with relative ease. Bookmarks play an important role in a well-styled workspace for a number of reasons, including these. To add a bookmark, click the Bookmark icon on the toolbar. 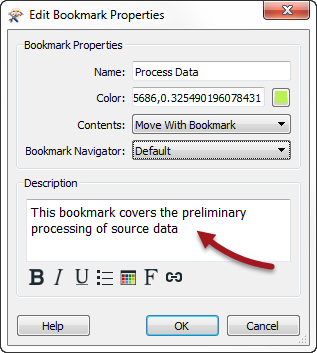 Whereas a traditional bookmark marks just a single page in a book, the FME bookmark can cover a wide area of the canvas. A single workspace can be divided into different sections by applying multiple bookmarks. If any objects on the workspace canvas are selected when a bookmark is created, the bookmark is automatically expanded to include those items. 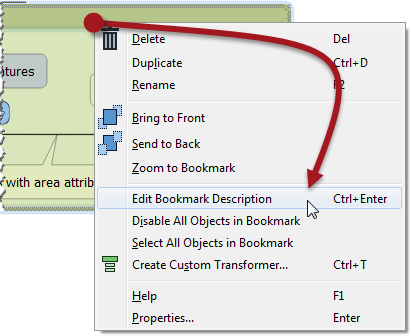 To resize a bookmark simply hover over a corner or edge and then drag the cursor to change the bookmark size or shape. Double-clicking a bookmark title allows the color and title of the bookmark to be edited. Bookmarks are shown either as a frame around white-space or filled with color. Tools > FME Options on the menu bar opens a dialog with a number of sections, one of which (Workbench) has an option to have color-filled bookmarks. Properties: Open a dialog to set bookmark name and color. A bookmark description shows as a block of text inside the bookmark. Like annotation, it can be styled to a specific font or color.